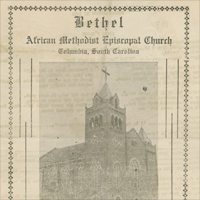 Eugene Avery Adams (1886-1958) was a minister in the African American Episcopal Church and a leader in the fields of education, civil rights, and business. He was a founder of Bell Street High School in Columbia and a trustee of Allen University. He also helped start the South Carolina Citizens Committee, a state-wide organization that advocated for voting rights and equal teacher pay. Furthermore, he served as president of the Columbia branch of the NAACP. With respected businesses, he was one of the founders of Victory Savings Bank.